I love cooking dinner for my family. I'm not an amazing cook, but I have compiled several dishes that I can make really well, and I change up some dishes that I can make (example: sub chicken for shrimp, and vice-verse) to give us more variety. I steal recipes off of Holly's blog, and take credit for them (Thanks Girl!). My children LOVE my meals. Every night without fail, my son looks at his dinner, and says "Wow Mom this looks good!". Then after his first bite, "This is a really good dinner Mom". I have 3 nights a week off from cooking (work/Daddy nights), so I feel it's really important for us to sit down as a family on those other four nights and eat dinner together. I grew up at a table of 8 seven days a week, so it is important to me to have that family/dinner time with my kids. I have said before I am not a short order cook, and kids are only picky eaters if you allow them to be, so my kids eat anything and everything-or they don't eat. So, here is tonight's dinner. 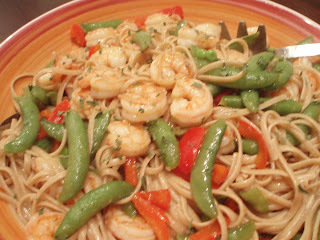 It consists of sauteed shrimp, red bell peppers, sugar snap peas, and the Whole Wheat Pasta with an easy sauce made with orange juice, sesame oil, red pepper, chicken bouillon granules, s/p and cornstarch. I also squeeze some fresh oranges over the dish when it is all in the skillet for some extra flavor. It has 337 calories, 22g of protein, and 6 grams of fat per serving. Not too bad. If you want to try it out, email me and I will send you the actual recipe. It's delicious. 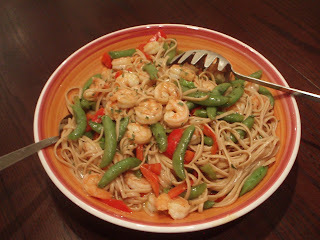 Tuesday nights dinner was delicious as well, and very simplistic. London Broil marinated in McCormick Montreal Grill Mates seasoning (in a package with instructions on what else to add), an Asian Vegetable Medley, and Velveeta Shells (one of my weaknesses). I cook the meat in the oven on a cookie type sheet (pour all marinate as well) on 350 for 20 minutes, take it out and slice it, and then put it back in on broil to desired red/pink/dead- however-you-like-it readiness. This was right after the incident. 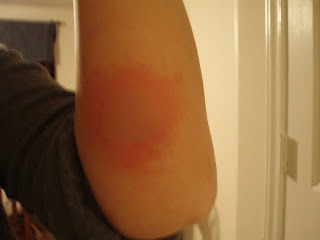 It looks so bad, but really only stung for a minute. I finished cooking, ate dinner, and went about my business. I didn't think much of it. 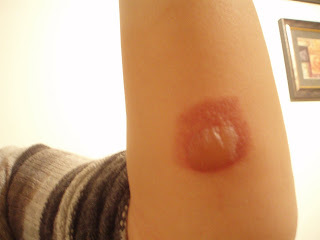 Here it is 2 days later. That's HOT. I don't care who you are. I wish it would POP. I refuse to let Robert pop it, I want it to pop on it's own. It's in a 'leaning' spot, so it's annoying. It feels kind of neat.....In a sick weirdo way.....when you rub it. Okay, I'll shut up now. I think I will steer clear of the oven and stick to the stove top for Saturday nights dinner. I'm a little scarred right now. Literally.